Landlubbers beware! A thrilling collection of illustrated stories full of nail-biting danger, booming canons, mysterious treasure hunts... and plenty of parrots. 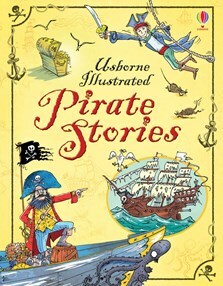 Stories such as The Captain’s Cat, The Bookish Pirate, The Battle of the Toasted Cheese and others are bristling with swashbuckling sea dogs, cursed cabin boys and even zombie pirates! Finished to a high standard and colourfully illustrated, this hardback book would make an excellent gift for any pirate enthusiast. Ideal for sharing together, the simple text also makes this book perfect for confident readers to enjoy alone.